"Turkish Evil Eye: when you visit Kusadasi Turkey, do not be surprised the Turkish people take their Turkish evil eye very seriously! " Just a few minutes after you walk off your Mediterranean cruise ship it will start jumping out at you! And very often, you will see them pinned to the shirts of newborn babies. So, what’s the deal with this evil eye, you must be thinking!? And why would something called evil be one of the Turkish souvenirs to buy in Kusadasi? Namely, throughout the Mediterranean and the Middle East, many people believe that, even though unintentional, praise from others or their envy of something you own can bring you bad luck. So, even though the name of this symbol is evil eye, it’s somewhat misleading… in reality it does not suggest an intentional curse on someone. 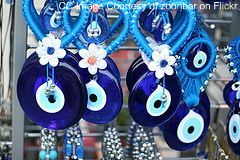 The Nazar Boncuk charm (or Evil Eye Bead) is an "eye", often set on a blue background. Why blue? It has to do with water being very precious in this part of the world… therefore the blue color of the water stands for prosperity and growth. How old is the Turkish Evil Eye? Evil eye beads go back thousands of years. The earliest written references to the evil eye occur on Sumerian clay tablets dating to the third millennium BC. Later, even the great historians and playwrights like Hesiod, Plato, Plutarch, Theocritus and others referred to the evil eye in their writings. In Turkey and Greece, throughout the republics of Central Asia, the effects of the "evil eye" are believed real, and genuinely feared. So, when you visit Kusadasi Turkey or go on a daily Ephesus tour, do not be surprised the Turkish people take their Turkish evil eye very seriously. Like Turkish Evil Eye Page?